Scrollbar Anywhere allows to scroll the page as if the scrollbar is under your mouse pointer. Just hold the right (or any other) mouse button down and move the mouse. Enjoy! Scrollbar Anywhere version 0.14.2 is compatible with Firefox 22. Version 0.14.2 fixes the bug: Scrollbar Anywhere loops when scrolling is initiated on a non-HTML element. This package is compatible with Firefox 22. Version 0.14 is compatible with Firefox 22. Version 0.14.2 fixes the bug: Scrollbar Anywhere loops when scrolling is initiated on a non-HTML element. Version 0.26 is compatible with Firefox 21. In particular, scrolling issues are fixed. Presentation change in the Settings panel (use of tabs). Minor bug fixes and ability to select the gestures trigger button through a hidden pref. Ability to select where the extension is installed. Settings window has been made resizable and flexible. AutoScrolling now works in textareas, select boxes, div with overflow:auto, etc. Trails color has been given a UI. Reordering of gesture customization window items through DnD. Unix systems (Linux, Solaris, etc) can use the right button to trigger gestures without having the context menu popping up. Context menu pops up on mouse button up. New gesture to hide Flash animations. New UI to define the mouse gestures trigger button. Scrollwheel navigation switches tabs directly (aka tab rocker). Fix to issues introduced by native autoscroll and bug 211030. Gesture creating a HTML page displaying the user gestures. Wheel scrolling in the tab bar. Option for "Open Links in Windows" gesture. Installer in line with last builds. New gestures to open bookmarks in tabs. Gestures can be individually enabled / disabled. Move to the new XUL tree widget API. Can be installed to Firefox 0.9 branch and to the trunk as well. New gesture to open a blank tab (always). Problem with Mac OS X context menus is fixed..
New gesture functions to go directly to AiO options and to view Frame Info. Rocker and scrollwheel gestures are now customizable. New gesture functions (list at the end). Ability to select the tab to focus after a tab close. Ability to define several gestures for gesure function. Mouse gesture extensions are based on event listeners invoked when mouse events are generated. When extensions are not merged, these event listeners may not be triggered (because the first extension receiving the event may stop the propagation of the event) or may perform actions conflicting with the other extensions. Merging the gesture extensions ensures that none of the above cases arises and gives a common look and feel to the each part. For the moment, All-in-one extension is a Phoenix-only extension. It is a relatively small package (36 KB versus 31 KB for 0.3.2 stand-alone Mouse Gestures). Two packages are provided: one for "pre-Ben Goodger" builds and one for current builds. In both packages, everything is working including Settings (the new term for preferences) and Uninstall button. Each of the four extension families can be disabled individually through the extension Settings. AFAIK, there are no compatibility problems with the TBE extension. Uninstaller uses SHIMODA Hiroshi's (aka Piro) exUnregister.js code. Much cleaner and more generic than the original code from Optimoz. Mouse gestures extension is well-known and doesn't need to be presented. Very polished code. People not familiar with this extension can click here to get more information. As already mentioned, Mouse gestures can be disabled / enabled through the extension Settings. Mouse Gestures start is triggered by pressing the mouse right button exclusively. A new gesture, to go to fullscreen mode, has been added. It's Right, Down, Left, Up (i.e. drawing a screen). The same gesture allows to leave the full screen mode, back to normal mode. The capability to disable / enable some specific gestures through the Settings has been added. Rocker navigation allows to perform Back (resp. Forward) action when the mouse right (resp. left) button is pressed and the mouse left (resp. right) button is clicked. Rocker Navigation can be disabled / enabled through the extension Settings. Two modes (selection is made through the Settings) are proposed: "A la Optimoz" or "A la Opera". In "A la Optimoz" mode, both mouse buttons must be depressed between two consecutive gestures. In "A la Opera" mode, the application tries to keep the status of the mouse buttons and you can perform multiple Backs (resp. Forwards) keeping the mouse right (resp. left) button pressed. Since mouse events are lost during page load, I recommend "A la Opera" mode only for faster machines where loading the page from the cache is almost instantaneous, unless you are cautious not to release the depressed button during page load. Scroll Wheel Navigation is initiated by depressing the mouse right button and rolling the scroll wheel. Releasing the mouse right button performs the action. Scroll Wheel Navigation can be disabled / enabled through the extension Settings. When initiated over a link, a tooltip containing the link URI is displayed. Releasing the mouse button erases the tooltip. When not initiated over a link, Scroll Wheel Navigation can run in one of the following two modes (selection through the Settings): tab scroller or history scroller. In Tab Scroller mode, all tabs appear in a popup window. You can select the tab you want to move to by rolling the wheel. The tab you come from (if any) is remembered and is written in italic in the popup. When you release the right button and the selected item in the popup is the current tab, the application automatically moves you to the tab you come from (if any). This provides a convenient way to toggle between two tabs. Rather obscure, isn't it! In the History Scroller mode, the history of the current tab / window appears in a popup window (i.e. the contents of the little buttons close to the Back and Forward buttons are merged). Use the scroll wheel to select the page in the history you want to move to. The selection of the mode can be made dynamically. If the option "Navigate through Tab / History depending on delay" is selected in the preferences, one of the mode will be selected dynamically if the delay between the mouse down event and the wheel rolling event is less than 1s and the other mode if the delay is greater or equal to 1s. Autoscrolling is the ability to make your page scroll automatically. Speed and scrolling direction are controlled by the mouse pointer position relative to the initial marker. If you're not familiar with this extension, click here to get more information. To initiate the autoscrolling feature, click the middle button. If there is something to scroll, the marker will appear. Then mouse movements will make your page scroll. Another click on the middle button stops the operation. Autoscrolling can be disabled / enabled through the extension Settings. a pseudo-logarithmic algorithm is used to smooth the scrolling speed. detection whether there is something to scroll has been enhanced. hang, occuring when autoscrolling is initiated during page load, has been hacked. Radiobuttons in the Settings menu are not showing correctly once changed from the default. Variables overlayContainer and autoScrollMarker should be initialized to null. Suppress the too jerky diagonal autoscrolling. Instead, perform vertical or horizontal scrolling depending on the mouse pointer position relative to the marker. Set the scrolling interval to 30 ms.
Set the history / tab delay to 700 ms from 1 s.
/ext is missing in the URL under author's name in Options -> Extensions panel. Rename Recognize -> Enable and Enable -> Allow. Since English is not my native language, I really don't know what I'm doing here. Set the scrolling interval to 40 ms. Faster machines scroll too fast. Minor code changes just to make it prettier. No functional changes. Hereafter are the two packages. Enjoy ! This version includes the modifications needed to work with Ben Goodger's preferences rewrite. This version works with builds released prior to Ben Goodger's preferences rewrite. All-in-one extension version 0.3 is still a Phoenix-only extension. The package is smaller (34 KB) than version 0.2 (36 KB) thanks to several file merges (though the code is bigger). Only one package is provided: for current builds. Those using pre 2003-02-02 builds will have to stick with version 0.2. Mouse gestures customization allows the user to define, for each function accessible to this application, the gesture which will, when recognized, trigger the function. To disable a function, just don't assign any gesture to it. Customization management is activated by clicking the Customize button in the Settings page. A window displaying the Function <-> Gesture table is shown. Editing this table with the four editing buttons will produce the customized gestures. in Mozgest pre-0.3.5, diagonal gestures post processing was not working very well. Mozgest 0.3.5 recognizes diagonal gestures on the fly, but it costs some code. With gesture customization, a lot of gestures becomes available (an average user uses around five gestures). The user customization is saved in a Phoenix preference. This pref is a string concatenating the gestures corresponding to all the functions. Using a pref (compared to a RDF file for example) greatly simplifies the code though it has some drawbacks. The way the mode can be selected dynamically has changed. It is no longer based on a delay. It is now based on the way the first scroll wheel rotation is made (clock wise or CCW). When autoscrolling is performed with the middle button held down, releasing this button will stop autoscrolling (in version 0.2, autoscrolling continues "fingers-free"). Since All-in-One 0.3 add new prefs and obsoletes some old ones, it is highly recommended to cleanly uninstall All-in-One 0.2 (this will remove the prefs) before installing All-in-One 0.3. Use the Uninstall button in the Settings. For those advanced users who are not afraid editing prefs.js, an alternative is to remove all the prefs containing "allinonegest.xxxx" in prefs.js. Obviously, you don't want to lose your customization when loading a new Phoenix build. In theory, you won't as long as you don't use All-in-One Uninstall button, which removes all All-in-One prefs from prefs.js. To prevent a misuse of the Uninstall button, I recommend, when your customization is OK, to copy the pref "allinonegest.gestureString" from the file prefs.js to the file user.js. The advise, in the previous paragraph, applies when a new version of All-in-One is installed. Notice that adding new gesture functions, will not jeopardize your customization. History Back (the first row) is broken. Fixed by changing "if (gesturesTable[aGesture])" to "if (gesturesTable[aGesture] != null)" in gestimp.js. Crash when initiating autoscrolling in the grey window just before the first content shows. Fixed. Autoscrolling marker doesn't show in frames whose height is less than the rendering area height. Fixed using scrollWidth, scrollHeight, clientWidth, clientHeight properties of the body element. Autoscrolling marker may not show when native scrollbars have a size less than 16. Fixed miraculously by previous patch. Gesture function "Open New Window" doesn't work if the home page is a multiple URLs homepage. Fixed by opening the first URL only. Changed <!DOCTYPE window ... to <!DOCTYPE dialog ... in pref-allinonegest.xul and gestcustomization.xul for XML correctness. All-in-One extension now installs in the user profile chrome directory. It is not necessary anymore to re-install the extension when the Phoenix build is changed. Two new functions have been added to mouse gestures: Scroll to top of page and scroll to bottom of page. Hereafter is the package. Have fun! Version 0.3 includes Mouse Gestures Customization. All-in-one extension version 0.4 is still a Phoenix-only extension. The package is smaller (32 KB) than version 0.3 (34 KB) due to the merge of the prefs and customization XUL files. This package is only for current builds. Those using pre 2003-02-02 builds must use version 0.2. Mouse gestures customization no longer displays in a separate window. Instead, in the settings window, two tabs are provided: one for General Preferences and one for Gestures Customization. In some cases, after a gesture has been performed, the first right click doesn't pop the context menu up. Fixed. Until this version, the right button was the only button that could be used to perform mouse gestures. A few people asked me to allow the left button as well. I still think that the right button is the only button performing correctly (no text selection, no link following by mistake, etc). However, since allowing other buttons is a "one line patch", I did it through a hidden pref. This hidden pref is named "allinonegest.mousebuttonpref" and its type is integer. If the pref doesn't exist, All-in-One will use the right button. All-in-One will never create this pref automatically. Those who want to customize the trigger button will have to create the pref (for instance using about:config or editing user.js) and set its value to the trigger button (0: left, 1: middle, 2: right). All-in-One 0.3.3 landed the installation of AiO extension in the profile directory. It enables to change the Phoenix build without having to reload All-in-One. Unfortunately, I didn't think about the reverse: changing AiO without changing the Phoenix build. In AiO 0.3.3, the Uninstall button will remove all All-in-One prefs. This is not what is expected when upgrading to a newer release of AiO only (especially now that gesture customization is in). Release 0.4 will ask, during the uninstall process, if you want to retain the prefs or not. If you're still using a version prior to 0.3.3, you need to uninstall it cleanly from the "program chrome" folder using the uninstall button. If you need to retain your prefs, save them from prefs.js before uninstalling and restore them after the installation of 0.4. Save your prefs from prefs.js, uninstall 0.3.3 using the uninstall button, install 0.4, close Phoenix restore the prefs and start Phoenix. Don't use the automatic install. Instead, download allinonegest04.xpi. Extract allinonegest.jar from allinonegest04.xpi and replace the old allinonegest.jar in your "profile chrome" folder by this one. This is the simplest method but reserved to advanced users who know what they are doing. All-in-one extension version 0.5 is more and more a Phoenix-only extension. Considering the recent announcements, it will remain a Phoenix only extension. The package is bigger (34 KB) than version 0.4 (32 KB) due to the addition of gesture trails. This package is only for current builds. Those using pre 2003-02-02 builds (e.g. Phoenix 0.5 official version) must use version 0.2. "Gesture trails" has been implemented. Gesture trails can be disabled (default) / enabled through the general preferences in the Settings window. Trails don't accept any customization (color is some red, width and height are 2 pixels, opacity is 100%). A better recognition algorithm (well, I think so) has been implemented. Doesn't change fundamentally the behaviour. AiO 0.5 installer allows to select where the extension is to be installed: program folder or profile folder. Uninstaller has been enhanced to uninstall cleanly, whatever the installation folder is. In the confirm dialog asking if you want to retain the prefs, the meaning of the OK and Cancel buttons has been reversed. OK now saves the prefs (since I think this is the most frequent case). Since some people were concerned by the fact that the Settings window could not fit in the screen at lower resolutions, I made this window more flexible (in the XUL meaning) and resizable. To do the latter, I had to collapse the normal Settings window (which is currently not resizable) and open another one. Don't be surprised to see a little strip just behind the Settings window. This is a minor glitch which will be suppressed as soon as Phoenix developers make the Settings window resizable (if ever). Hereafter are two screenshots of Settings window (one for each tab). Uninstall with the uninstall button and, when prompted, click the button that retains your prefs. Start Phoenix, install the new AiO 0.5 xpi and restart Phoenix. Recommended method. Close Phoenix. Don't use the automatic install. Instead, download allinonegest05.xpi. Extract allinonegest.jar from allinonegest05.xpi and replace the old allinonegest.jar in your "profile chrome" folder by this one. Restart Phoenix. Firstly, install AiO 0.5 in the same folder (i.e. the profile folder), using one of previous paragraph method. Then, uninstall AiO using the Uninstall button and reinstall All-in-One extension 0.5 in the program folder. The installer (install.js) has been enhanced to recognize Phoenix build and to install in the right folder accordingly. Installer refuses to install when BuildID is zero (self-made build). Fixed. The color of gesture trails can be configured through the "allinonegest.trailColor" hidden preference. This pref is never created by AiO and must be created by the user (for instance, using about:config or user.js). Values are strings of the form #hhhhhh, where h is any hexadecimal character, representing the RGB value of the color. The default value is #F00000. Gesture trails don't work in XUL pages (e.g. about:config). Fixed by suppressing trails in XUL pages. Context menus are not blocked when a gesture is started in a XUL page (e.g. about:config). Fixed. Hereafter is the package. Enjoy! All-in-one extension version 0.6 is a Mozilla Firebird-only extension. The package is slightly bigger (35 KB) than version 0.5 (34 KB) due to new features. "Double Image Size" and "Halve Image Size" functions don't work correctly, in some cases. Fixed. Middle clicking on a map area starts Autoscrolling instead of opening the link in a new tab. Fixed. No checks when customizing a gesture with the + (any sequence) character. Fixed. Autoscrolling is now able to perform on any areas that have scroll bars. This includes textareas, select boxes with multiple rows (those without a dropdown list) and any div with an overflow: auto CSS rule. See it in action at this page. Selection of the color of gesture trails can be made through a colorpicker. Reordering of rows in the customization panel is now possible. To perform reordering, select a row, drag it to a new location and drop it. A drop feedback indicates where the drop will take place. For example, this feature makes possible to regroup all the actions having a non-empty gesture at the top of the window or to regroup all the actions related to a specific topic (e.g. tabs). BTW, it was big fun to program. Basically, this action is the same as what you can find in the TextLink extension by Ted Mielczarek. This new action replaces one of the "Close Document" actions that was duplicated uselessly. If it stole the gesture you're using for "close document", just swap the gestures Close Document <-> Open Selection in New Tab. View Frame Source. In previous versions, only "View Page Source" was available, but actually, on pages with frames, it was performing a "View Frame Source". This new action replaces one the "View Page Source" actions that was duplicated uselessly. If it stole the gesture you're using, just swap the gestures View Page Source <-> View Frame Source. Uninstall with the uninstall button and, when prompted, click the button that retains your prefs. Start Phoenix, install the new AiO 0.6 xpi and restart Phoenix. Recommended method. Close Phoenix. Don't use the automatic install. Instead, download allinonegest06.xpi. Extract allinonegest.jar from allinonegest06.xpi and replace the old allinonegest.jar in your chrome (profile or program) folder by this one. Restart Phoenix. If you're upgrading from AiO 0.4 or older, follow the instructions given in "Upgrading to All-in-One 0.5". Added the new gesture function: "Reset Image Size"
Adding new functions beyond actual limit is not working. Fixed. Added conversion from backslash to slash for Open Selection in New Tab. Added hidden pref "allinonegest.trailSize". Allowed values between 1 and 6. Default is 2. Suppression of whitespaces in selection for Open Selection in New Tab. Added GUI for pref "allinonegest.trailSize". Scrollwheel doesn't move the selection when mouse pointer is inside the popup. Fixed. Prefs are not checked against valid bounds. This may cause problem when values are edited via about:config. Fixed. When the buttons are released quickly after a rocker gesture, the context menu may not show on the next right click. Fixed. Don't show the context menu when a gesture is aborted by the timeout. "View Page Info" gesture always shows the security tab first. Fixed. The new gesture "Open/Close Bookmarks in Sidebar" has been added. The rocking gestures now fires on mouse button up to prevent following links. AutoScrolling (and trails) too much sensible to divs styled with the background property. Fixed. When AiO is used along with TBE, bookmark (personal) toolbar entries get duplicated on Open New Document (and similar) gestures. Fixed. Revert rocking gestures to fire on mouse down, excepted the back rocker when initiated over a link. All-in-one extension version 0.7 is a Mozilla Firebird-only extension. The package is slightly bigger (38 KB) than version 0.6 (36 KB) due to new features. This package is only for current builds (i.e Firebird 0.6 and later). Due to the behaviour of the right click on Unix sytems (i.e. popping up the context menu on the right mouse button down), it was nearly impossible to use the right mouse button to trigger the gestures. This has been modified and Unix systems can now use the right button to start gestures. The context menu on right mouse button down is suppressed and added on button up when necessary. Hide Flash Animations. This action hides all the flash animation areas in the page, placing a [Click to View] text in the area. Clicking in the area shows again the clicked Flash clip. When performing a back rocker action with Rocking A La Opera, the context menu pops up. Fixed. RMB for Unix systems doesn't work correctly. Fixed. New context menu blocker blocks submenus as well. Fixed. New gesture action: Copy current URL to ClipBoard. Scrolling with the wheel in areas where "standard gecko" wheel scrolling does not work (divs with overflow: auto, textareas, etc) is now possible. All-in-one extension version 0.8 is a Mozilla Firebird-only extension. The package is slightly bigger (39 KB) than version 0.7 (38 KB). Due to the fix to bug 211030 (behave the same as IE), scrolling is not working for pages in quirks mode. Fixed. Native Autoscroll has been introduced in Firebird. This creates conflicts with All-in-One AutoScroll. Partly fixed. Ability to switch from tab to tab on the fly using the scrollwheel. No popup will be shown. A checkbox in the Advanced Preferences tab controls this setting. Ability to have All-in-One AutoScroll work without the marker. A checkbox in the Advanced Preferences tab controls this setting. Settings are no longer available in AiO. File platformDialogOverlay.dtd no longer exists. Fixed. Better coexistence between AiO and native autoscroll. Suppression of the collapsed window in AiO Settings. Settings renamed Options following Firebird wording. When the left button is selected as the gesture trigger, some basic actions with the left button are no longer working. Fixed. When the left button is selected as the gesture trigger, allow to perform the left button default action (e.g. text selection, etc) along with the gesture. A new pref is provided to enable this. Now that native autoscroll has a pref to enable / disable, disabling AiO autoscroll no longer disables native autoscroll. AiO autoscroll can be made faster through a new pref which disables the display of the mouse special cursor. The new gesture function "Goto first page in history" has been added. Autoscroll prefs now manage the standard autoscroll as well (I'm not sure this is a good idea, but we will see). "general.autoscroll" can't be set outside AiO preferences anymore. Unix users can select through a new advanced pref whether middle clicking in text boxes performs paste or AiO autoscroll. Pressing the Return / Enter key when editing a gesture (during gesture customization) no longer close AiO pref window. Gesture sequence duplication is checked against gestures with Any Sequence. Advanced pref "Don't show special mouse cursor" has been changed to "Show dedicated mouse cursor". Some fixes from Mozgest have been included (Close tab gesture on java or plugin-containing pages no longer breaks browser and gesture trails no longer inherit site's DIV styles). For some users, AiO is not initialized correctly when mixed with TBE. Hopefully fixed by handling the load event during the bubbling phase. Since "general.autoscroll" can't be set outside AiO preferences anymore, the pref is disabled in Tools -> Options -> Advanced. The new strings are not localizable. Fixed. Version 0.8 fixes scrolling bugs and adds "Tab Rocking" and AutoScroll without marker. All-in-one extension version 0.9 is a Mozilla Firebird-only extension. The package is bigger (43 KB) than version 0.8 (39 KB) due to the addition of an html file. When this new gesture is played, a new tab is created. It contains a table showing the association function <-> gesture. A small picture of the gesture is displayed when possible. This page can be printed normally. This feature is the same as TBE's (Tab Browser Extension). When the mouse pointer is inside the tab bar, rotating the scroll wheel switches to the next tab. When TBE's is present as an extension in your browser, this feature is deactivated in AiO. This feature can be enabled (default) / disabled through a preference. An advanced preference controls the direction of the switching. The default is the tab to the right when scrolling down. A new middle button scrolling has been added. It's the Grab and Drag scrolling which is similar to Acrobat Reader's scrolling. Two new preferences are provided to control autoscroll behavior more precisely. The first preference enables / disables (default) the ability to start autoscrolling when the mouse pointer is over a link. The second preference controls whether releasing the middle button inside the marker zone transforms panning (i.e. autoscrolling with button held down) to autoscrolling (i.e. scrolling with middle button released). IE and native Mozilla Firebird autoscrolling offer this feature. Normally, this gesture opens a new window for each hovered link. A new option is available to open only one new window and each link in a tab. The window for AiO options has been made resizable. Furthermore, the size and position of this window persist across browser sessions. Autoscroll or wheel scroll should not work in DIVs with overflow: hidden. Fixed. node.clientWidth and node.clientHeight broke in Firebird for some pages. As a consequence, autoscroll does not work correctly on some pages. Fortunately, a hack is able to make things work the right way. Thanks to AiO (or the Smoothwheel extension) wheel scrolling is possible in overflow areas. When Smoothwheel is present, AiO let it do the job. However, when Smoothwheel extension is not present, AiO does the scrolling but did not take into account the smooth scrolling pref. Fixed. Limit the number of chars for scroll wheel navigation popups. Fixed. A 3s timeout release is experimented in "rock a la Opera". On builds after December 11, AiO install script will rely on builtin dialog for installation success and browser restart. Gesture functions are misordered in HTML page. Fixed. The fix to bug 227567 broke All-in-One scrolling. The problem here is that 0.8 branch has been branched before the fix (i.e. 0.8 branch builds are not broken). This issue is fixed for trunk builds named 0.8.0+. "Close current tab" gesture was missing and has been added. "Link tooltip" is introduced. It is similar to "nice titles" except that it uses standard tooltips (maybe I should call it "ugly titles"). Tooltips are elaborated on the fly i.e., at every mouse move, the extension checks whether the mouse pointer is over a link. This can create performance problems on slower computers. When a link has the target="_blank" attribute, the tooltip text is colored in red. "Link tooltip" can be disabled / enabled through All-in-One options. Testing the last 6 chars for equality with "0.8.0+" is not enough since some builders add their signature at the end of the userAgent string. Fixed. Switching tabs directly with Scroll wheel navigation is broken. Fixed. New gesture functions: "Increment digit in URL", "Decrement digit in URL" and "Clear digit flipper". Existence of Link target window is not determined correctly. Fixed. "Increment / decrement digit in URL" functions doesn't work when the number has leading zeros. Fixed. New gesture function: "Save links to Disk". "Show gestures in web page" function doesn't work when new functions are added. Fixed. When a link is made of an image and text, use the image "title" or "alt" attribute alone to make the title of that link. Fixed. "Hide image" gesture function is replaced by the more general "Hide Object". The object, under the mouse when the gesture is started, is nuked. New gesture function: "Undo Close Tab". Tab must have been closed with the "Close current Tab" gesture. History is not restored. New gesture function: "Print Preview". A new middle button scrolling mode is introduced: "AiO autoscroll + Grab and Drag". In this mode, Autoscroll performs when the middle button is clicked and Grab and Drag when the middle button is maintained down. When Autoscroll exits, under some conditions, text is selected. Fixed. Exiting AiO options crashes Firefox trunk. It seems to be caused by the options window being made resizeable. Fixed but the options window is no longer resizeable. Mousewheel scrolling speed broken. Fixed. AiO options window is once again resizeable (for trunk builds after 2004-02-19). AiO autoscrolling allows the use of the arrow keys for scrolling speed changes. For complexity reasons, this is only available for the body of the document, not for scrollable DIVs. Mouse wheel scrolling in scrollable DIVs, textareas, etc uses the system pref mousewheel.withnokey.sysnumlines and numlines to compute the number of lines scrolled at each rotation. - opening a tab according to the system pref is of little use since middle-clicking does it. "Undo Close Tab" action must open the Tab in the Foreground. Fixed. AiO advanced options: Mouse trigger button "radiogroup" is not centered. Fixed. Tab switching doesn't follow the visual order when TBE tab-groups are used. Fixed. New gesture function: Delete cookies from this site. AiO has a pref to indicate what to do when a middle-click takes place in a text box. It is only active on Unix systems. On the other hand, there is a system hidden pref (middlebutton.paste), valid for all OSs, which has the same role. Fixed by suppressing the AiO pref and use of the system pref on all OSs. AiO still has a checkbox option named "Middle-click pastes in text boxes" which sets the value of the "middlebutton.paste" system pref. "Undo Close Tab" uses the TBE code if TBE is present. If TBE is not activated, AiO code is executed (it only restores a tab closed with the AiO "Close current tab" gesture). AiO uninstallation prevents other extensions to work. Fixed. Weird result when playing the 'Duplicate window' gesture in the tab generated by 'Show my gestures ...'. Fixed by replacing the "|" char by ",". New hidden pref "allinonegest.mouse2buttons". When set to true, the middle button is emulated by Ctrl + Right button (only for scrolling). Gesture trails do not cross frames / iframes. Fixed. Scrollable areas detection is improved in the case of frames / iframes. New Grab and Drag default scrolling mode: virtual scrollbar. Holding the middle button down, and moving the mouse acts as if the scrollbar thumb is under the mouse pointer. 'A la Acrobat Reader' mode is still available through an advanced preference. New gesture function: 'Undo Hide Object'. Code cleanup (all global variables have been prefixed with aio, etc). Warning: Due to a change in directories in allinonegest.jar, it is not possible to update to 0.9.11 by just replacing the allinonegest.jar file. Use the Uninstall button to cleanly uninstall AiO before installing 0.9.11. Event timestamps broke on Linux builds. This makes gestures not to be cancellable by releasing the mouse button if no mouse movement during 500 ms. Hopefully fixed by using new Date() instead of the event timestamp. AiO Autoscroll + Grab and Drag: when middle-clicking and nothing to scroll, next click is lost. Fixed. Grab and Drag: restore mouse cursor with cursor='auto' instead of cursor='default'. Fixed. Scroll wheel navigation popups: Popups can be positionned more precisely using showPopup(). Fixed. Grab and Drag in Select element: changing the cursor resets the scrollable view. Fixed by not changing the cursor. AiO now works with any Firefox builds (trunk or branch). Link tooltip with mouse wheel is now controlled by the link tooltip pref. All-in-one extension version 0.10 is a Mozilla Firefox-only extension. Package size is 50KB. This package is only for builds which have the XUL tree API changes (post 20040416). Thus, it will refuse to install to Firefox builds issued before April 17th 2004. Two new functions, named "Open Favorite Bookmark #1" and "Open Favorite Bookmark #2", allow to open bookmarks in a new tab. The bookmarks are identified by specific keywords. Favorite Bookmark #1 is identified by the keyword AiO1 (not case sensitive), while Favorite Bookmark #2 is identified by the keyword AiO2. Before this feature, disabling a function implied to clear the associated gesture. Now, a status (enable/ disable) is associated with each gesture function. In the gesture customization page, an icon shows the status of the function. To toggle the status, just click on the icon. When a function is disabled, the associated gesture is still recognized by AiO but no action is performed. The "Duplicate Tab" gesture has been given its own function named aioDupTab. This enables the Clone Window extension to override AiO's standard function. Left button initiated popups in XUL pages doesn't show. Fixed. Version 0.10 adds "Open favorite Bookmark" gestures, ability to enable / disable gestures, etc. All-in-one extension version 0.11 is a Mozilla Firefox-only extension. Package size is 54 KB. The xpi file for this package is compatible with both installation modes: the old one using the install.js script and the new one using the firefox 0.9 extension manager. On Mac OS X, context menus are not working. New gesture function: "Open blank Tab"
Although "Open new tab in Foreground" is able to open a blank tab when the gesture is not started over a link, some users are asking for a dedicated gesture that doesn't care about the gesture location. Function "Close Document" is replaced by function "Close Window"
"Close Document" was closing the current Tab. If this tab was the last one, the window was closed. Since the function "Close current Tab" already exists (though it never closes a window), I changed (at the request of some users) "Close Document" to "Close Window". If the gesture is performed with more than 1 tab open, a confirm dialog may popup. An advanced pref controls whether the confirm dialog pops up or not. AiO now enables multiple row selections (using Shift + click and Ctrl + click). Only usable, for the moment, to perform multiple "Clear gestures" operations. Link tooltip now shows the size of the link, when available. This makes Link tooltip more useful and attractive. AiO leaks pref observers when a window is closed. Fixed. AiO scroll wheel navigation: Unable to scroll for some positions of the popup (screen bottom). Fixed. Gesture function "Up a directory in URL space" has been renamed "Go up to parent directory / domain". It now uses the much more sophisticated code from Stephen Clavering's GoUp extension. Gesture function "Open new Document" is renamed "Open new Window". Action is unchanged. Uninstall the previous version using the uninstall button prior to installing the .xpi file. This is really mandatory when installing to the 0.9 branch. "Close Document" function is restored as it was in 0.10 and before. A new function "Close Window" is added. Link size in Link tooltip has been discontinued since it's not working properly. "Open new Tab in Background (resp. Foreground)" action has been simplified. It always opens the tab in the Background (resp Foreground) whatever the browser options are. When the LMB is the trigger for gestures, a new option allows to prevent starting gestures when the ALT key is depressed (i.e. to perform normal left button actions, depress the ALT key). maxVersion has been set to 0.9+ in install.rdf. New gesture action: "Open new Window in the background". "Open new Window" is renamed "Open new Window in the foreground". When editing a gesture mapping, it is now possible to draw the gesture. When editing a gesture mapping and the new gesture is already in use, AiO proposes to swap the gestures. Wrong logical test prevents LMB gestures to work properly in some cases. Fixed. After DnD, AiO needs an extra click to work. Fixed. All-in-one extension version 0.12 is a Mozilla Firefox-only extension. Package size is 57 KB. Context Menus on Mac OS X. Right click context menus do not show on Mac OS X. Fixed. New gesture function: "Edit AiO Options"
This gesture enables to go directly to AiO options window. Much faster than the lengthy Tools -> Extensions -> double click on AiO. New gesture function: "View Frame Info"
It is the complement of "View Page Info" for frames. Default gesture actions have been sorted and regrouped by family. New default gestures for Double Image Size (RULD), Halve Image Size (LURD), Hide Object (LDUL) and Undo Hide Object (LUDL). AiO code loops when visiting some sites with frameset. After a few seconds a script error box comes up. Fixed. Multiple rows selection is now allowed for Drag and Drop in the gesture customization tree. New gesture function: Show History sidebar. New gesture function: Open Bookmarks Manager. New gesture function: Translate this page (uses Google service). AiO stops working when visiting http://www.voipchoices.com/packet8-info.html. Fixed. Left clicking dropdown menus at http://www.skandiabanken.se does not work. Fixed. Three values are selectable in AiO Options for the auto-scrolling refresh rate. "Normal" corresponds to the current value (40 ms) while "Fast" corresponds to 20 ms and "Faster" to 10ms. Must be set according to your computer power. Gesture actions "Scroll Down" and "Scroll Up" now move the content by 80% of the scroll frame height instead of a constant 200 pixels. Undo Close Tab now works whatever the closing action is (close button, middle-click on tab, context-menu, gesture). If TBE (or undoclosetab extension) is present, AiO still calls it to perform the Undo Close Tab action. AiO does not work in pages that redefine window.top. Fixed. Using Grab&Drag scrolling or Autoscroll, pages scroll strangely. Fixed. Hide Flash Animations now hides animations that are in Iframes as well. New gesture action: Open Download Manager. AiO breaks XML pages without formatting stylesheets (standard XMLPrettyPrint formatting). Fixed by not drawing the gesture trails and the autoscroll marker on such pages. AiO should not perform mousewheel scrolling when Firefox can do it. Fixed. When gesturing, AiO now displays the name of the gesture composed so far in the status bar. New hidden pref to disable AiO mouse wheel scrolling. AiO is not loading properly on Mac OSX. Fixed by changing the way the string bundle is handled. New gesture function: Return to previous Selected Tab. New gesture function: Show / Hide Status Bar. In "Open new Tab in Background" (resp. Foreground), a blank tab (when the gesture does not cross a link) always opened in the foreground. Now it follows what the function says. Code for older Firefox versions (uninstall, ...) has been removed saving 5 KB. Version 0.12 fixes the problem with context menus on Mac OS X.
All-in-one extension version 0.13 is a Mozilla Firefox-only extension. Package size is 55 KB. The xpi file for this package is compatible with Firefox 1.0. Customizable Rocker and Scrollwheel gestures. 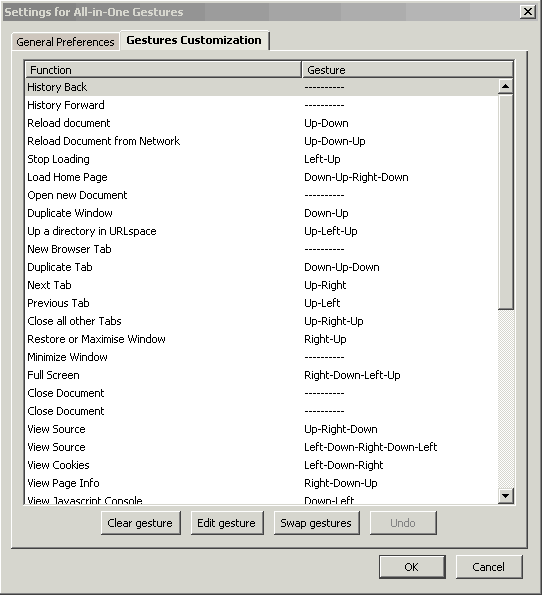 Rocker gestures and Scrollwheel gestures can now be assigned to any gesture function defined in AiO. For scrollwheel gestures, the "Perform gesture actions" radio button must be selected. To customize these gestures, goto the gesture customization tab, select the gesture (at the end of the table) and click the "Edit function" button. Then clicking on any row will assign the function of the clicked row to the gesture. Functions which have a repetitive nature can be repeated without releasing the trigger button. The "Allow repetition for actions that load pages" advanced preference controls the repetivity of functions that load pages. New gesture functions: "Zoom In Image/Text", "Zoom Out Image/Text" and "Reset Image/Text Size"
These functions are a merge of Text Size and Image Size functions. If the gesture is started over an image, the image function is executed; otherwise the text function is executed. They are the default functions for scrollwheel gestures. New gesture function: "Reload Frame"
New gesture function: "Show/Hide Find Bar"
New gesture function: "Reload All Tabs"
Now, "Warn on closing a window with multiple open tabs" has a UI. AiO pref is no longer useful and has been removed. Standard Firefox pref is used instead. AiO Tab Bar Scroller no longer interacts with miniT Tab Scroller (i.e. AiO is used). AiO Tab Bar Scroller now uses a workaround on Linux systems (same workaround as miniT's). "Undo Close Tab" gesture function uses miniT if present. Remember that if undoclosetab (or TBE) is present, AiO will use this extension. Pressing the Enter key in the "Digit Flipper Schema Builder" window acts as clicking the OK button. On Linux and Mac OSX, "Add a Keyword for this Search..." is missing in the context menu when right clicking inside a textbox. Fixed. New gesture function contributed by Christian Kruse: "Follow Next Link". This function follows the link specified in the <link rel="next" ...> tag, if any. If no such tag, it searches the page for links whose text contains one of the keywords specified in AiO options. Default keyword string is "next|>". While adding the UI for "Follow Next Link", the "Advanced Preferences" Tab has been split into 2 tabs: Advanced Prefs #1 and Advanced Prefs #2. This leads to a better handling of 800x600 screens. New preference "'Close all other Tabs': Never Warn" to compensate for "Warn on closing a window with multiple open tabs" suppression. "Follow Next Link" may not work on pages containing <area> tags. Fixed. (the original code by Christian didn't exhibit the problem!). Scrollwheel gestures: one can play both gestures without releasing the mouse button even if they are not related. Fixed. "Open New Tab in Foreground" function now uses Firefox's BrowserOpenTab function. Some extensions (e.g. TBP) overwrite BrowserOpenTab and, with the current code, AiO cannot take benefit of it. New gesture function: 'Fast Forward'. 'Fast Forward' acts like the normal 'Forward in History' function as far as there are pages in the forward history. Once at the end, it acts like the 'Follow Next Link' function. New gesture function: 'Search for Selection in New Tab'. The text selected is searched using the search engine selected in the search bar. The results of the search are displayed in a new Tab. The search bar content is updated. "Open new Window in Background" function never opens a blank window. Fixed. "Open new Window in Background" function: sometimes the windows are being opened in the foreground. Hopefully fixed. Context menu keys (Shift+F10, etc) doesn't work in AiO. Fixed. AiO doesn't work with 1.0+ trunk builds. Fixed. "var platform = ...." is not executed when an option is changed. Fixed. Version 0.13 features customizable rocker and scroll wheel gestures. All-in-one extension version 0.14 is a Mozilla Firefox-only extension. Package size is 66 KB (the increase is due to the french localization). The xpi file for this package is compatible with Firefox 1.0, 1.0.1, 1.0.2 and 1.0.3. Notice that version 0.13.4 is not compatible with Firefox 1.0.3 and later (see below). 'Search for selection in new tab' and 'Open selection in new tab' no longer work in Firefox 1.0.3. Fixed by changing _proto_.getSelection.call() to something using XPCNativeWrapper. Option to select the next tab to focus when a tab is closed. - the opener of the closed tab. New gesture function: "Save Image as...". New gesture function: "Go to Last Tab". New gesture function: "Follow Previous Link". Identical to "Follow Next Link" for previous links. "Follow Next / Previous link" actions: NextPlease! is used if present. "Follow Next / Previous link" now searches all links for the first string, then all links for the second string, etc instead of the first link for any string, etc. "Follow Next / Previous link" actions: now, default search strings are localizable. "Follow Next / Previous link" actions: now, search strings support non ASCII chars. "Undo Close Tab" action now restores the tab history as well. An option has been created to open in a new tab the page from "Go Up to parent directory / domain" or "Load Home Page" actions. Default still opens in current tab. Check for Unix platform now includes freebsd. GMail now works with LMB selected as the gesture button. New option to limit Grab and Drag scrolling to vertical scroll only. Some issues with LMB with default action enabled have been fixed (though the patch doesn't fix all the problems). 'Fast Forward' is broken. Fixed. Default gesture string is missing one item. A user starting from scratch will miss 'Fast Forward' and have 'Last Tab' twice. Fixed. 'Open links in Windows' and 'Open links in Tabs' are broken since links are not recognized during the mouse travel. Fixed. Japanese localization thanks to Anbo Motohiko. Left Rocker Gesture: when assigned to a function that allows implicitly multiple operations, the context menu is not suppressed at the end of the gesture. Fixed. French localization: file aiogest.html is buggy. Fixed. Version 0.14 features 1.0.3 compatibility, new gesture actions and ability to select the tab to focus after a tab close. All-in-one extension version 0.15 is a Mozilla Firefox-only extension. Package size is 79 KB (the increase is due to the german localization). The xpi file for this package is compatible with Firefox 1.0.4 and Deer Park Alpha 1. It is now possible to define several gestures for a single action. Just select the action and click the "Add gesture" button. A new row is inserted. Notice that "Add gesture" and "Edit function" shares the same physical button, the label depends on context. German localization, thanks to Armin C. Schneider. "Follow Next / Previous link" actions: default search strings with non ASCII chars don't work. Fixed. "Follow Next / Previous link" actions: some links may be missed. Fixed by using textContent property instead of text property. window.status doesn't work in current 1.1 trunk. Fixed by using directy the XUL box properties. German localization: customize.add is named customize.swap. Fixed. install.rdf is not parsed correctly by the rdf parser. Fixed. Bump maxVersion to 1.0+ to make AiO work with latest trunk builds. On trunk builds, tab selection doesn't work anymore after a tab drag and drop. Fixed. On trunk builds, advanceSelectedTab must have a second parameter (set to true) to enable wrapping. Fixed. Gesture customization doesn't work when non existing functions are encountered (can be the case when switching back to an older version of AiO). Fixed. Version 0.15 features multiple gestures per action and German localization. All-in-one extension version 0.16 is a Mozilla Firefox-only extension. Package size is 75 KB (decreasing). New gesture function: "Open URL from Clipboard in new Tab". New gesture function: "Back to Last Page of Previous Domain". New gesture function: "Back to First Page of Current Domain". New gesture function: "Forward to First Page of Next Domain". New gesture function: "Forward to Last Page of Current Domain". Gestures don't work on xml+xsl documents. Fixed. "Show/Hide Find Bar" function has been enhanced: If something is selected in the page, this text is automatically pasted in the find text box. Now, the action "Hide Find Bar" is only performed when the find bar is visible and there is no selection in the page. "Translate this document" function: the URL for the translation is now localized. The file aiogest.html no longer needs to be localizable. The page for "Show my gestures in new tab" is generated dynamically at the time the gesture is performed. Check if moveTabTo exists rather than FF version for tab handling. Version 0.16 features 5 new gesture functions, enhancements and fixes. All-in-one extension version 0.17 is a Mozilla Firefox-only extension. Package size is 83 KB (increase is due to two new locales). The xpi file for this package is compatible with Firefox 1.0.6 and 1.5 Beta 1. Traditional Chinese (zh-TW) locale thanks to Jose Sun. Russian (ru-RU) locale thanks to Infant. New AiO logo thanks to Bryan Yurasits. All known incompatibilities with 1.5 Beta 1 have been fixed. Gestures are not working with the left button as the trigger button. Fixed. Spanish localization, thanks to Carlos at Proyecto Nave. Max version bumped to 1.6 for trunk compatibility. Tools->Extensions->AiO->Options crashes in 1.0.7. Fixed by going back to 1.6 code. Simplified Chinese localization, thanks to Rikky. Version 0.17 is compatible with 1.5 Beta 1. It also adds Traditional Chinese, Simplified Chinese, Russian and Spanish localizations. All-in-one extension version 0.18 is a Mozilla Firefox-only extension. Package size is 98 KB (increase is due to one new locale). The xpi file for this package is compatible with Firefox 2 RC 2. Korean (ko-KR) locale thanks to Sushizang. New gesture function: "Print" (not localized in all languages). Russian (ru-RU) locale enhancement thanks to Infant. Under Unix and OS X, context menu is not displayed correctly when right clicking in a textarea. Fixed. When autoscrolling, left arrow / right arrow keys move the page in the wrong direction. Fixed. Licence.txt describes better who are the original authors of each module used in AiO. Version 0.18 is compatible with Firefx 2 RC 2. It also fixes a few bugs and adds a Korean locale. Thanks to David Tenser and Stefan Huczics for letting me start from their CSS file for this design. © 2002-2003 Marc Boullet for the content; David Tenser & Stefan Huszics for the design.